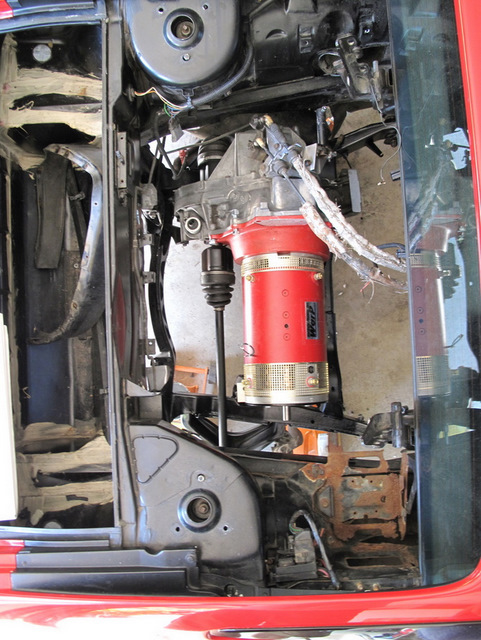 To finish the installation of the 9" motor going in, I have to be sure it doesn't move around as it tries to power the wheels. 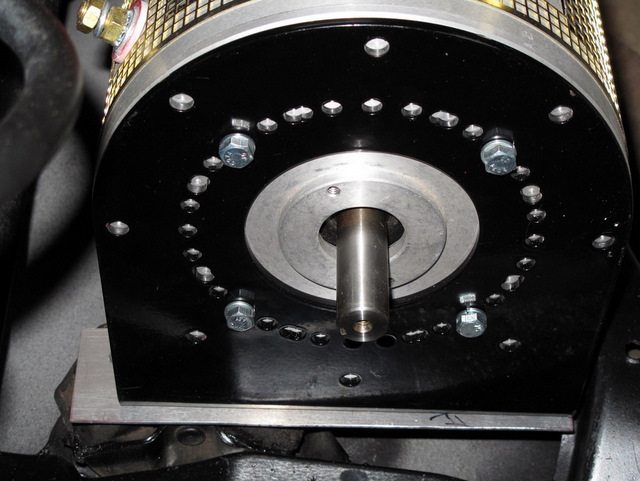 To do this, I had to measure out and fabricate a steel motor bracket. Using a bit of foam core, I created a mock up of what I wanted the mount to look like. 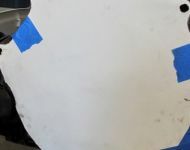 With our model, I asked my friends at Birdwell Machine in Redmond to help weld the real thing. 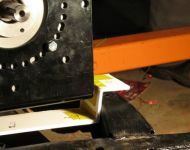 After a few quick cuts off a piece of 2 by 1/4 steel stock, we clamped all the pieces together to create our welding jig. A few blinding flashes of light later our motor mount was very solid and very warm. 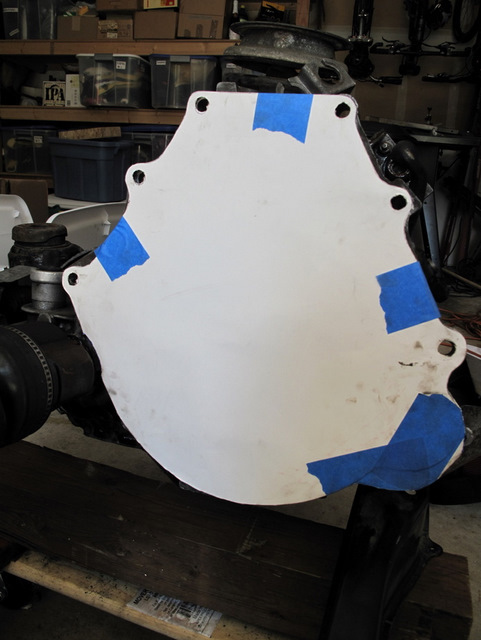 Once home with our new part, I spray painted it black to match the rest of the motor mount, fastened the two together, and bolted the entire motor to the subframe of the car. 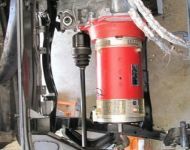 With the addition of a few vibration dampening rubber mounts and some long bolts to fasten it all down, our motor was secure in the subframe. 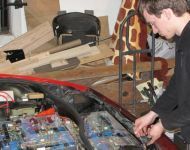 Once the subframe gets bolted back into the car, we should be ready to wire up the last 24 batteries of the pack. 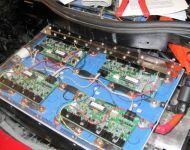 Finally, all of the batteries in the front of the car are fully installed and wired with their BMS modules. 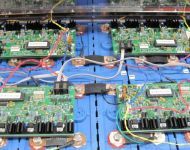 With this completion, we are now two batteries past half way through our high voltage installation. 28 batteries × 3.2 volts/battery = 89.6 volts... plenty to kill someone. That's why there're 3 fuses already in the system. 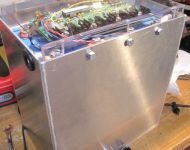 Once finished, we'll have 7 high voltage fuses in the system. In the end though, the thing that'll protect you best is your brain. Don't do any thing stupid like touch too leads at the same time or lay a tool across your batteries and you'll be just fine. The BMS (Battery Management System) we're installing in our car's battery pack is a chain of 13 Manzanita Micro Mk3x4 Digital Lithium Regulators. These little slabs of silicon are the insurance policy for our lithium battery pack. 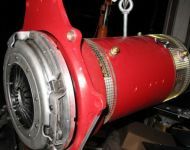 Essentially, they keep the batteries they control within the normal operating charge and temperature limits for those batteries. As an added bonus, this system can feed back data about all of the batteries to an on-board computer in the cabin and to the charger so the car knows when to stop charging. 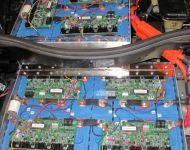 When batteries are connected in series, even if they are closely matched when new, over time their exact capacities and voltages will drift apart. 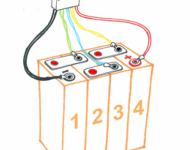 With flooded lead-acid batteries, one can charge them until the most full batteries start gassing and then keep going until all of them equalize. The ones which gassed can simply have more water added. 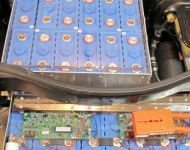 With sealed lead acid batteries or lithium (like mine), if overcharged, they can vent and therefore have permanent capacity loss. 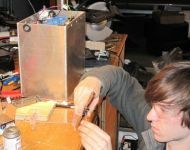 The intent of the Mk3x4 is to bypass current around a fully charged lithium battery so that all the other batteries in a long series string can get fully charged without any one becoming overcharged. 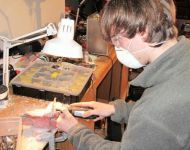 This is accomplished with circuit boards attached to a pack of four 3.2 volt batteries. 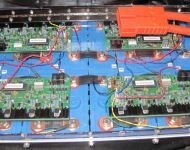 These boards are able to sense the voltage across the cells individually and turn on bypass resistors to bypass current around the individual cells instead of going through the full cells. The circuit has a blink feature that changes duty cycle in response to the needs of the individual cells. What all this means to the end user is that when using the regulators in conjunction with an appropriate charger, one can charge and equalize the batteries very quickly without worrying about damaging them. 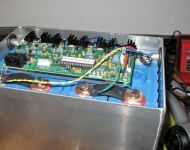 Fast, full charges coupled with equalization means less down time, more range per charge, better battery health and longer life.The digital communication bus allows detailed continuously updating graphical battery and BMS data display using a PC and the BMS monitoring software can view text based important battery and regulator information. 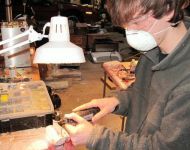 This information includes battery voltage,regulator heatsink temperature and other information. To install these modules into a pack, Manzanita Micro supplies a digital and physical copy of the Mk3x4 manual with your new purchase. 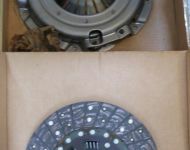 They also give you two zip-lock bags, one filled with 13 ten pin plastic blocks and hundreds of little 22 gauge wire crimps which clip into the plastic blocks. These blocks and crimps hold the wires that feed the BMS with all the battery information. 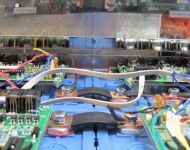 Once securely fastened into the block, wires are also fully electronically isolated to keep from shorting across batteries. That makes handling the BMS wiring harness that much safer in high voltage installations. 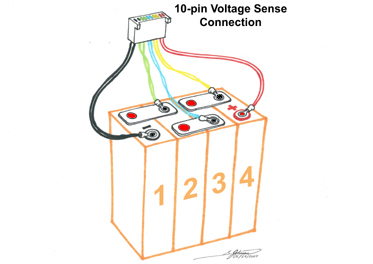 As shown in the illustration to the right, the ten pin connector has two of every color wire: black, green, blue, yellow, and red. In the system I set up, the lengths of those wires are 4.5", 6", 9", 10.5", and 11" respectively. Once fastened onto the battery termnials, I can mount a BMS module onto one of my custom lexan trays and slide it in under the net of wires. 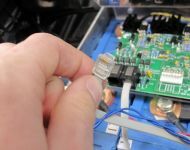 A firm click into the 10 pin connector makes the BMS light up and run through a POST (Power On Self Test) where it checks that all functions are operating as intended. 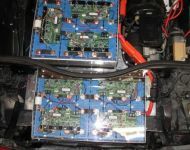 So far, we have 7 of these systems installed on the 28 batteries that are housed at the front of the car. 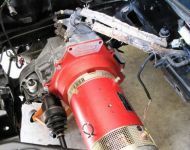 This is a major milestone in my 1986 Pontiac Fiero electric car conversion project. 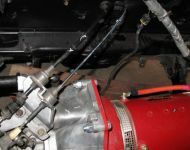 After numerous delays getting the correct adapting hardware for the new motor to the old transaxle, we finally mounted the clutch and motor assembly onto the transaxle and frame of the car. 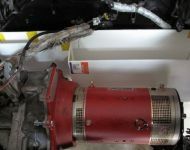 With everything in place, I applied a regular 12 car battery to the motor and amazingly, it ran without a hitch! 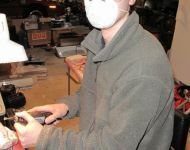 See my website (www.roboticmayhem.com) for more information on this project. 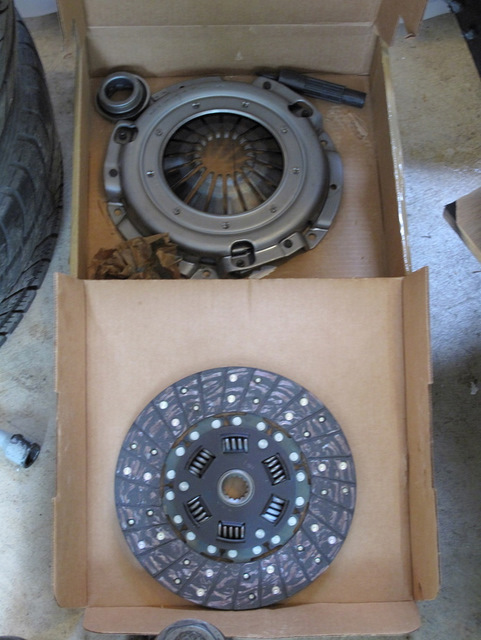 Its unfortunate how many delays there were in getting the clutch on the motor. 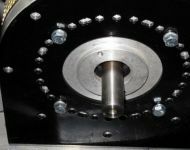 The first was the adapter for the flywheel which was not only the wrong one for our transmission, but also the wrong hole pattern for the flywheel. 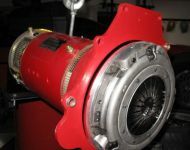 To fix this we bought an aluminum racing flywheel for better efficiency while accelerating and better range. Then when we got a new adapter, we still needed to modify it slightly. Then we found that the old adapter used standard threads and the new one uses metric. 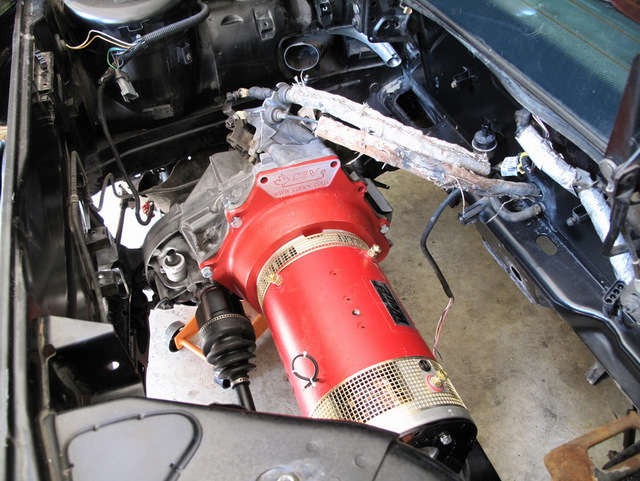 Then the inevitable happened: school began and the Fiero project got pushed back to the bottom of my priorities list. 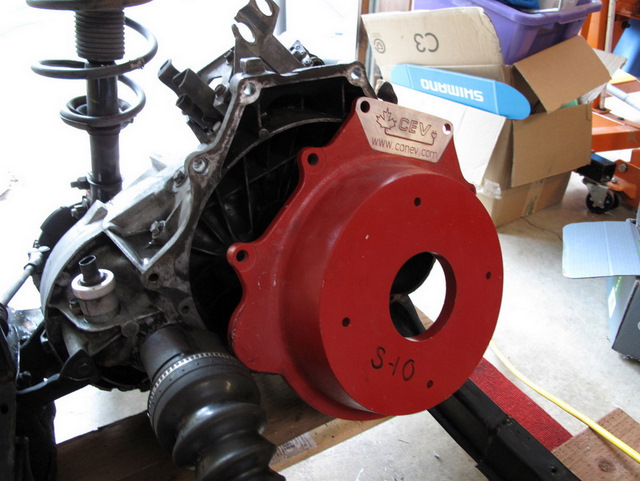 In any case, the Flywheel is all back in and ready to be mounted to the transmission. 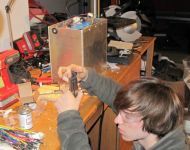 All that is left before we can put the subframe back in the car is to design and apply a more substantial motor mount. 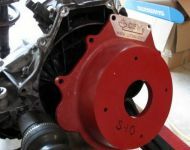 This motor mount will not only have to support the motor vertically, but rotationally as well. 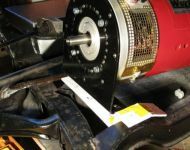 When the car accelerates, the motor torques around in its mount (for every action there is an equal and opposite reaction...) and the motor mount has to counteract that as well.